Source: The 3d surface colors. Normals: Contains the normal vectors matching the Source clip. Typically the red channel will have the X component of the normal, green will have Y, and blue will have Z, but you can adjust this mapping using the Normal Offset and Invert parameters on the second page. Diffuse Bright: Default: 1, Range: 0 or greater. Hilight Size: Default: 0.5, Range: 0 or greater. Diffuse Bright 1: Default: 1, Range: 0 or greater. Diffuse Bright 2: Default: 1, Range: 0 or greater. Diffuse Bright 3: Default: 1, Range: 0 or greater. Diffuse Bright 4: Default: 1, Range: 0 or greater. Light1 Dir: X & Y, Default: [-0.7 0.6], Range: any. Light3 Dir: X & Y, Default: [-0.7 -0.6], Range: any. Light2 Dir: X & Y, Default: [0.7 0.6], Range: any. 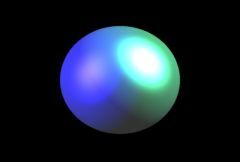 Light4 Dir: X & Y, Default: [0.7 -0.6], Range: any.